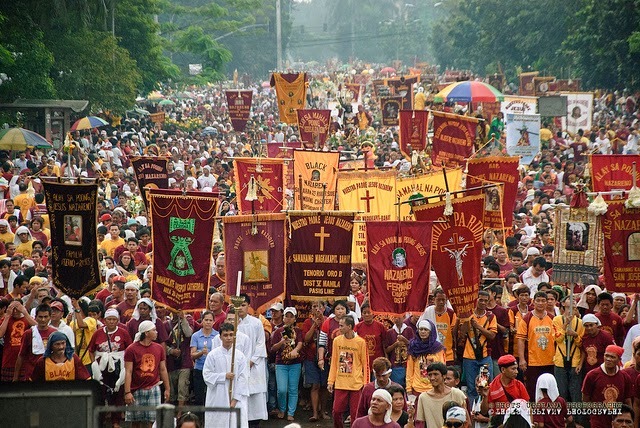 Manila - The annual Feast of Black Nazarene happens on Thursday, January 9, 2014. About 12 million devotees are expected to flock in the parade. Livestream video is now available here for netizens to monitor procession from Quirino Grandstand to Plaza Miranda in Quiapo. Earlier, a solemn mass led by Manila Archbishop Luis Antonio Cardinal Tagle was held at 6:00 in the morning. Videos are also available here courtesy of Rappler.com. The Feast of Black Nazarene commemorates the 'Traslación' or Passage of life-sized, dark wooden statue of Jesus Christ through procession or transfer of the image to its present shrine in Quiapo church. As the event draws millions of attendance, the government ensures that security and safety of devotees are in the 'top priority'. Meanwhile, Manila Mayor Estrada also suspends classes in all levels for this day.